It’s very challenging for organizations to implement necessary changes without alienating their employees. According to the Holmes-Rahe Life Stress Inventory, changes at work are as stressful as the birth of a new child and more stressful than the death of a close friend! In a recent course on “Leading Change” we discussed the Kübler-Ross model of emotions experienced by terminally ill patients. That model uses five stages to explain what is often called the ‘change curve’: denial, anger, bargaining, depression and acceptance. During the course, we had an excellent discussion that, as humans, we may be on many ‘change curves’ at one time. For example, someone who has experienced an emotional family issue may be in the bargaining phase for that change while they are also in the depression phase about a personal injury. Those changes already underway multiply the effect of a major change at work (like the layoff of 14,000 co-workers). General Motors has a significant challenge ahead…not only with the impacted employees but also with stakeholders like the media and government. It’s important for them to remember that everyone affected will see the change through the lens of the changes they are ALREADY going through. That also means some groups of stakeholders will arrive in the acceptance phase sooner than others. GM can take advantage of those early adopters to influence the rest of the population. We’ll all be watching their progress closely. RULE IV: Innovation requires a good idea, initiative and a few friends. In my last post on Change Ninjas we talked about the benefit of blending in to the organization and timing your advocacy of change. However, you can’t do it alone. I recently worked with an organization that wanted to see a significant culture change but didn’t have full time resources to dedicate to it. One person was clearly interested in being a ‘ninja’ and knew that they couldn’t do it alone…so where could they find partners? If you’re trying to inspire change, find people who are like minded (regardless of where they are in the organization), get them together, and get to work! Herb Shepard directed the first doctoral program focused on successful organizational change and performance. In 1975, he published “Rules of Thumb for Change Agents” which have held up surprisingly well to the test of 40+ years of time. Let’s take a look at one of them. Organizations are designed to deliver results but the world is changing around them. When change is triggered externally, most organizations find struggle to find the right people to help them respond. So, when a few brave souls take up the mantle of ‘change agent’ you would think that they would be celebrated…but that’s not usually the case. “Antibodies” in the organization, often at the middle management level, attack the internal change by convincing those who will listen why ‘it’s not a good idea’ and ‘things are fine just the way they are’. How do you survive the attacks from those internal antibodies? Become a Change Ninja…wait, a what!?! The two main roles of historic ninjas were espionage and strategy. Change Ninjas gather intelligence about the organization around them and figuring out ways (a.k.a. strategies) to influence the organization (most often indirectly). After peacefully living in the current system, Change Ninjas can jump out of their camouflaged position once opposition to change has been reduced. Some budget is available? Shed the camouflage and make a strong case for directing it toward the growth project. A team needs a new member? Make sure to nominate someone who is sympathetic to the changes that need to take place. When you need to make a major change, become a Change Ninja and live to fight another day! Need some ‘Introduction to Change Ninja training’? Johannes Mutzke and I will be teaching a our Leading Change class in the Upstate of South Carolina on November 13. More information is available here and you can register here. Would love to see you there! Not in the Greenville, SC area? Check out my book on the three types of people that are key to every change. Is helping others change an art or a science? I think it’s both! I recently spent a few minutes talking with Jeff Skipper of the Association of Change Management about the Certified Change Management Professional™ (CCMP™) certification. I was beta participant and one of the first 75 people in the world to obtain complete the coursework pass the test, and become certified. Interested in more information? Check out the video of our discussion! I think there are at least three special things that helped the ‘winner’ in each of these ‘wars’. I’ll be using a framework from a previous post (Want An Effective Solution? Work On Its Acceptance!) so take a read if the equation Q x A = E doesn’t sound familiar to you. The 8 Track was seen as the successor to vinyl records with the awesome feature of being able to skip to INDIVIDUAL SONGS! In addition, they were much more portable than vinyl…and players could be installed in cars. So why did the 8 Track lose out? Price and reliability. The cassette didn’t have a quality advantage but it was a few dollars cheaper and longer lasting. Consumers chose based on their needs, not just product quality. If you want your solution to be accepted, figure out what the ‘consumers’ of it need. Sony’s Betamax format was more reliable and had higher resolution than JVC’s VHS format. However VHS initially had twice the capacity and later four times (Beta’s 60 min vs VHS’ 240 min)…and this made all the difference. Consumers didn’t want to switch tapes when recording a movie or sporting event, even if the resolution was better. Don’t be fooled by thinking your solution will win out on quality alone. From 2006 to 2008, Sony’s Blu-Ray and Toshiba’s HD DVD fought to become the standard for high definition video. Cost was initially the differentiating factor with each solution having some minor technical differences. Both companies quickly created alliances with manufacturers of consumer electronics as well as film studios. Both sides had key wins in the ‘battle’ but the turning point was when Warner Brothers defected from HD DVD to Blu-Ray. Within a few weeks, Blu-Ray was the clear winner as most other major manufacturers abandoned HD-DVD. Keep your eyes open for possible alliances that can change the game. We just covered a few lessons here…what have you experienced? Why do I have to change when things are good? There are people around you who are perfectly comfortable the way things are. But, you know things need to change – because of opportunities or threats that most people haven’t seen yet. So how do you help people who are comfortable move to a new, better place? The late Dr. Michael Hammer was a gifted teacher and I once heard him discuss “Everything I Needed to Know About Transition I Learned in the Bible.” His premise: How do you make people see a need for change when things are good? Show them how things can go bad. The Hebrew people were in slavery to the Egyptians. They had to make mud bricks all day and build these huge pyramids in the baking sun. No fun. The relative safety and abundant food made them satisfied and when Moses arrived on the scene announcing it was time to move to a great new place (the ‘Promised Land’) he didn’t get much buy in. Hey Moses, are you sure there’s a better place than this? Sound like any change you’ve been involved in? After escaping Pharaoh, Moses led the people into the Sinai Desert. They had gone from Egypt (bad) to the Desert (very bad). No constant water supply, harvesting a miraculous food supply, moving regularly. They surely longed for the “good old days.” That is, until they crossed the Jordan River and arrived in the “Promised Land.” And it was good. So, do you need to move people to a “promised land” that they don’t want to visit? Take a lesson from Moses. Help them understand how now is bad, take them (if only in their imaginations) to a place that’s worse, and then lead them to the promise that is held by the future. Want An Effective Solution? Work On Its Acceptance! General Electric’s Change Acceleration Process introduced a very powerful equation: Q x A = E. While not on par with more famous equations like Einstein’s (E=MC²) or Pythagorus’ (A²+B² =C²), Q x A=E holds the keys to successfully getting your solution adopted. Let’s break it down. An awesome technical solution would have a high “Quality” score. A solution that all stakeholder love would have a high “Acceptance” score. Say you want to buy the best 65″Ultra HD 4K TV in the store. You’ve done all the research and decide to buy near the top of the line. Pick a TV, any TV! But say your significant other thinks that money would be better spent on a family vacation and will remind you of that fact every time you turn on the TV. What if you decided to skimp on quality a little and pay half the price? I mean are the differences really noticeable to the average viewer? …and you used that money to go to the beach so that you were able to watch the new TV without fear of commentary? This logic applies to personal changes (changing towns, homes, schools…) as well as professional ones (new benefits programs, software packages, office space). So, next time you have to find a solution to a problem, don’t just look for the best “Quality” solution, spend some time thinking about “Acceptance” too! Was there toilet paper all over the floor but none in the stalls? Was the mirror nearly opaque? Did the soap work and were there towels? Silly questions you might think…odds are high that there were toilet paper and towels, and the mirror was (relatively) clean. So, why was that area not an absolute disaster? Clearly, someone has the responsibility of keeping that area clean. In most public restrooms, you can find the ‘hour by hour’ chart that is kept to show that regular maintenance is done. When that maintenance is not done, we notice! The same is true with many things in today’s world but we can forget that if the grass is to be mown, the floors cleaned, and the plants watered, someone has to make it happen. Like the public restroom, maintenance isn’t usually appreciated until we miss it. Sometimes, deferred maintenance can result in disaster like the fire protection system failure at the World Trade Center on 9/11, the levee failures in New Orleans during Hurricane Katrina, and collapse of the I-35W Mississippi River bridge in Minnesota. All well known examples of a little-recognized issue. So, next time you celebrate innovation, don’t forget to take a look behind the scenes and look for the many maintainers that make it possible! Are you brave enough to do the wrong thing? 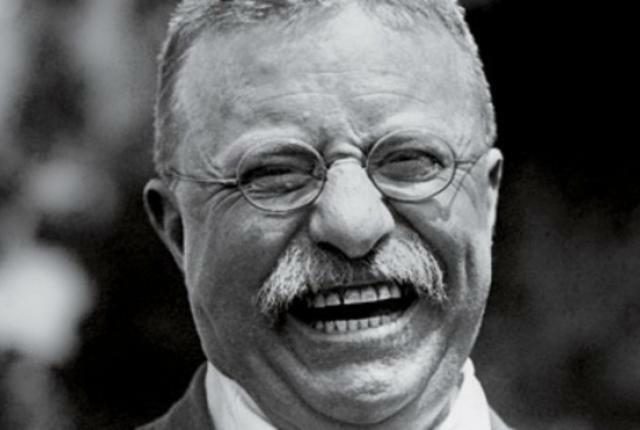 Theodore Roosevelt, the 26th President of the United States, is consistently ranked as one of the greatest U.S. Presidents. In fact, he’s held in such high regard that his face is carved into Mount Rushmore in South Dakota alongside three other great presidents. However, did you know that he had a pretty incredible number of setbacks? His exploits became legendary after these potentially devastating losses. He became the equivalent of Secretary of the Navy, formed the famous Rough Riders, served as Governor of New York, U.S. Vice President, and U.S. President. While President, he ordered construction of the Panama Canal AND won the Nobel Peace Prize. Today, I’m striving to do SOMETHING…and I hope you will too!